We select and we offer oriental fragrances in spray of the best brands of oriental perfumery . You will find the famous brands such as Arabian oud, Abdul samad al qurashi, swiss arabian and many others waiting for you in your shop. Scents combining fragrances of oriental fragrances with natural ingredients, chosen and selected for you with the greatest care. Olfactory notes combining agarwood, musk, amber and saffron. Strong and soft scents according to your choices. Perfumes There are 79 products. Asalat al Oud by Arabian Oud is a perfume rich in oud. 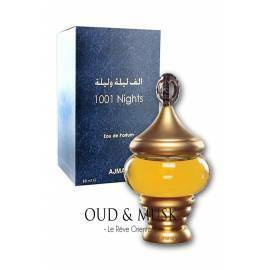 Asalat al Oud by Arabian Oud is a perfume rich in oud. Blue Oud is a woody oriental perfume, warm and voluptuous. Blue Oud is a woody oriental perfume, warm and voluptuous. Crystal Oud is a dynamic and woody oriental fragrance. Crystal Oud is a dynamic and woody oriental fragrance.